49-year-old man started losing hair about 10 years prior to consultation, so his age of onset was relatively late, and DHT-sensitivity moderate. He had a slow, diffuse hair thinning pattern, and also had thinning at the temples. With later onset and less aggressive pattern hair loss, DHT-sensitivity is not as high, so he wasn’t on finasteride. 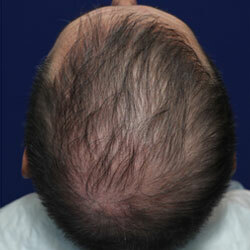 Scalp and crown hair coverage increased with a thicker caliper of hair after one Hair Regeneration session. No finasteride was prescribed due to later onset, and less aggressive hair loss due to lower DHT-sensitivity. 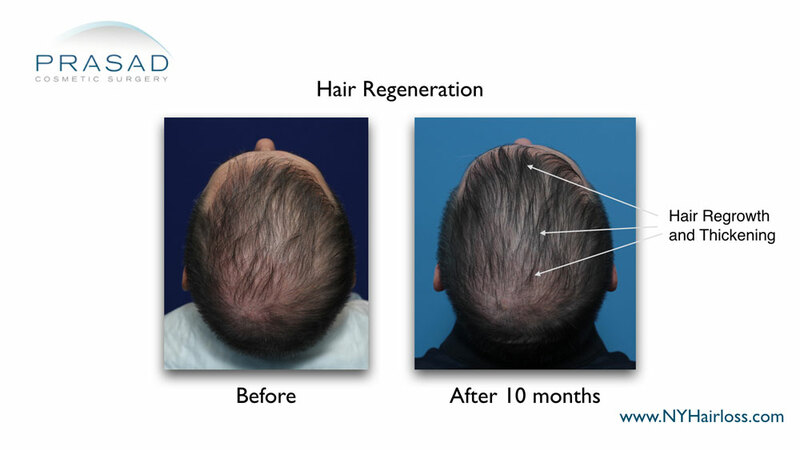 10 months after the Hair Regeneration treatment without taking finasteride, he gained more scalp hair coverage with thicker growth, and was able to get new growth at the temples. 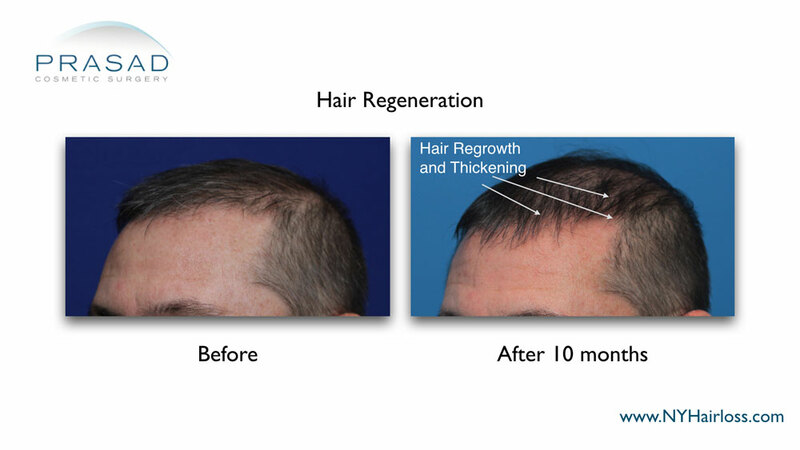 Hairline recession and thinning are common signs of male pattern hair loss, but the treatment was able to thicken miniaturized hairs, and stimulate growth of dormant follicles at the frontal hairline. For men who start losing hair in their teens, 20s, and early 30s, finasteride is almost always prescribed with Hair Regeneration. Early onset of hair loss is directly linked to high DHT-sensitivity, so a DHT-blocker is needed in these cases. However, for later onset and less aggressive pattern hair loss occuring in the late 30s or older, a DHT-blocker is not as critical, and determined in individual cases.